AcuteFruit Tropical Blast is the perfect morning drink to give your body great-tasting, low-calorie energy for the whole day! ACUTEfruit Tropical Blast is the reduced calorie, full-powered energy drink for active people seeking a healthier alternative to coffee, cola or traditional energy drinks. ACUTEfruit Tropical Blast is formulated with 50% real fruit juice and offers a sustained boost with no jitters, no carbonation, no preservatives & 12% daily value of fiber. 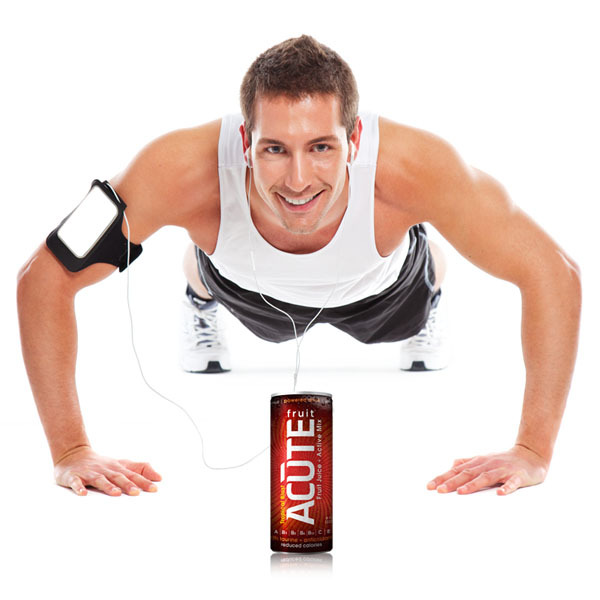 ACUTEfruit carries 40% less calories than ordinary energy drinks. Our caffeine level is equivalent to 2 cans of cola with 75% less calories. ACUTEfruit offers self-defense against the damaging effects of free radicals on cells and boosts your immune system with vitamins A, C, E, B3, B6, B12, B5 as well as Choline, Guarana, and Taurine. ACUTEfruit provides 12% of your daily (DV) of fiber in each can and is made with 50% juice. Enjoy no-jitters and sustained vitality.